Design and form have always been of great interest to me. I find woodturning is an excellent way to experiment with both. There seems to be no end to what you find when you explore wood. The artists that have had the most influence on my work and my concept of design and form are Michael Peterson, for his forms, textures, and finish alterations, Johannes Michelsen for his technique and the control of his tools, Christian Burchard for his form and processes, Rollie Munro for his unique sense of design and application, and Michael Lee of Honolulu with a true sense of form and balance. My woodworking interests developed early in life when my parents built the family's first home in Seattle in the mid 1950's. During high school I worked in construction for a neighborhood contractor. It was during this time in a high school shop class that I developed my love of turning. After high school I entered a four-year apprenticeship program in Seattle and Honolulu to become a journeyman carpenter. At the age of 24 I was the superintendent in charge of my first large project, The American Forestry Pavilion Building at the 1974 World's Fair in Spokane, Washington. During this time period I worked for a contractor that had a cabinet shop so I had access to a lathe. In 1981 I started my own construction business, building and remodeling some of the top restaurants in Seattle. In 1996 my mother gave me a large platter that I had turned in high school, which changed the course of my life. My interest in turning was renewed and I immediately bought a lathe and have since turned every chance I get. In 1999 I moved to Kailua Kona where I have designed and built a home and studio and am now turning full time. 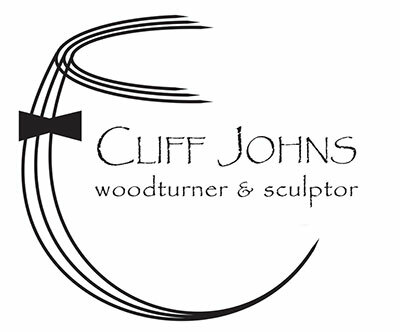 In 2009 I opened my own art gallery, The Cliff Johns Gallery now in Kainaliu, Hawaii, carrying works from the state's best woodworkers. In 2011, I co-founded The Hawaii Collaboration. This is an annual event that involves artists of all media from around the world coming together to produce art that is sold to raise funds to bring an awareness of art into our communities. I am so fortunate to have the many beautiful Hawaiian woods available to me here on the Big Island. The woods I use are procured from arborists, tree trimmers, and sites that are being cleared for development. Living in Hawaii has greatly changed my style of work. The wood that is available to work with in the islands has taught me so much in just exploring it, and the environment here has an even greater influence on what I produce. Ancient Hawaiian culture is of great interest to me. Studying the craft of Hawaiian bowl making is something I will never get tired of. What they could do with what they had is nothing short of amazing. May 2014 – June 2017 – Collection of seven bowls replicating ancient Hawaiian vessels on the sailing voyage of the Hokulea Worldwide Voyage during the leg of the voyage up the East Coast of the US. 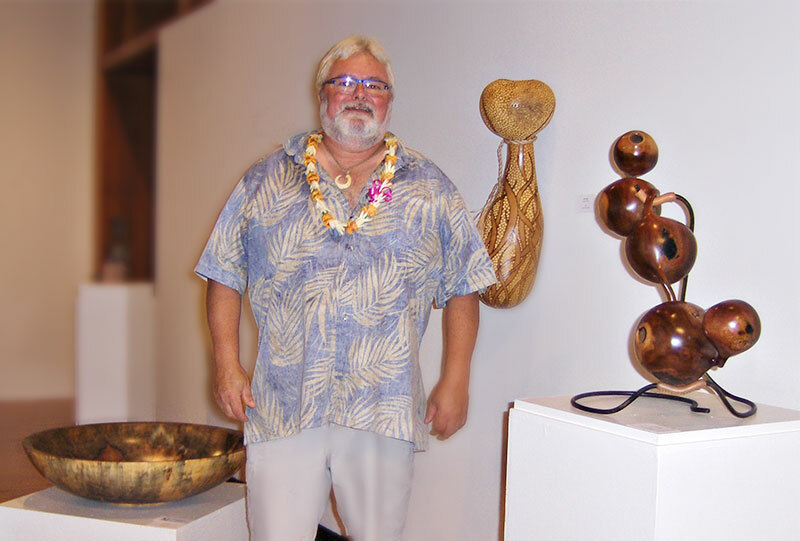 September 2014 - HFIA Woodshow Honolulu – Honorable mention in sculpture award. Hawaii State Foundation for the Arts and Culture purchased Ohana Series . An amazing annual collaboration event in the process of becoming much more. The West Hawaii Woodturners Club meets bi-monthly, sharing techniques, having club challenges, and providing demonstations and hands-on workshops by top woodturners. Hawaii Craftsmen is a state-wide member organization dedicated to increasing awareness of fine craft of all media. They feature several exhibitions and workshops annually in Honolulu. The Hawaii Forest Industry Association (HFIA) is dedicated to responsible forest management. 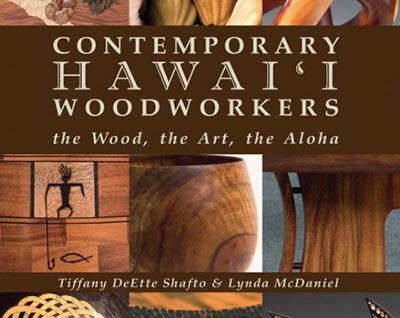 It offers an annual woodworking exhibition, sponsors the Hawaii’s Wood trademark, and serves as an advocate for Hawaii’s diverse forest industry — from tree planting and harvesting to creating and selling wood products. The Big Island Woodturners are a group of woodworkers that live mostly on the Big Island of Hawaii. Monthly meetings are held in odd numbered months, and the location rotates around to the workshop of various members. A Guild for woodworkings living on the Big Island, featuring an annual exhibition each February. September 2006 – More Woodturning Magazine - Cover picture of one of my pieces and a follow up article I wrote on Cedarshield, a product I use to dry my pieces. September – October 2017 – Keola Magazine – Article/ pictures of Hawaii Artiist Collaboration and Hokulea exhibit. Page 23, 25, 42-48.